How to get there: This route starts at the top of the cable car called Ciampac that runs from the small tourist resort named Alba. Alba is slightly further up the valley from the larger village Canazei. Canazei is about 2 hours drive from Trento, above Val di Fiemme, but in the same valley, the upper part of this valley being called Val di Fassa. 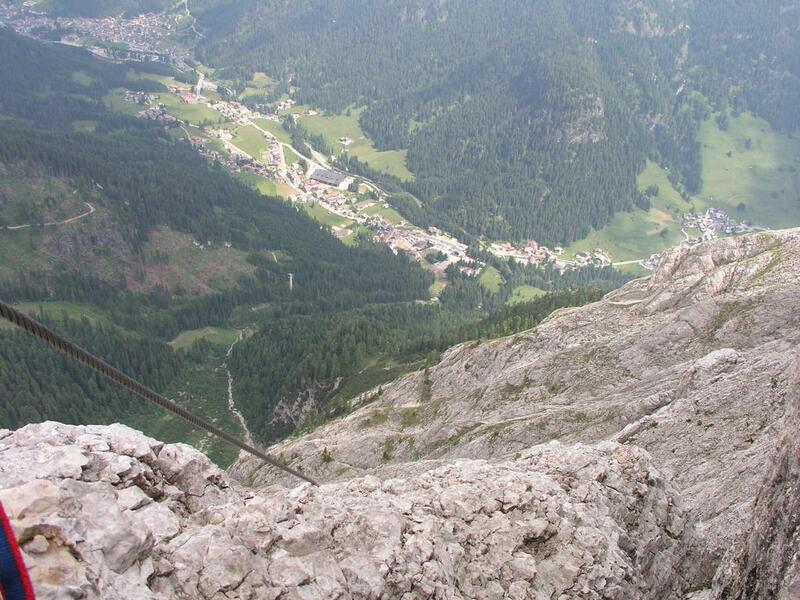 Route description: Ascent on Via Ferrata dei Finanzieri. Exit from the cable car to your left, directly towards the brutal looking mountain face separated from you by a small valley. Descend into and cross the valley. 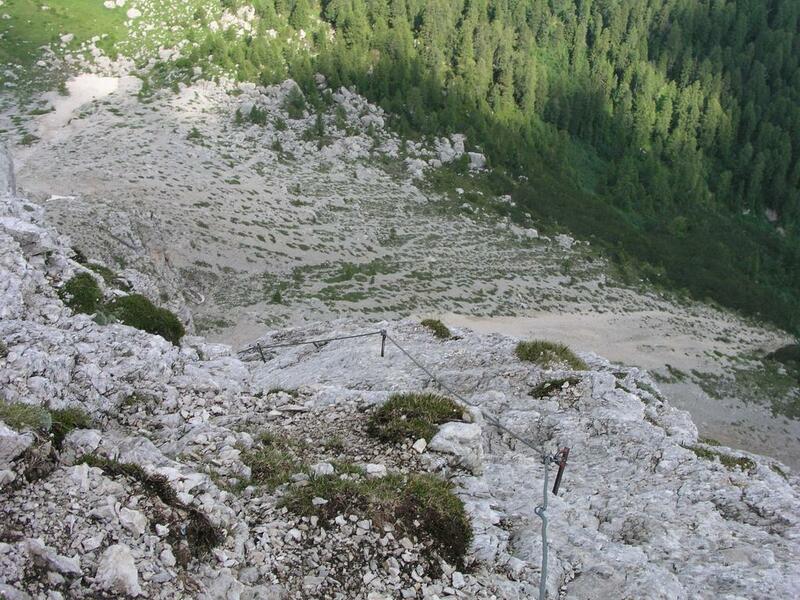 You will see the zig-zag trail that heads up on scree slopes to the beginning of the rock face in front of you. The trail crosses part of a botanical garden before climbing higher. 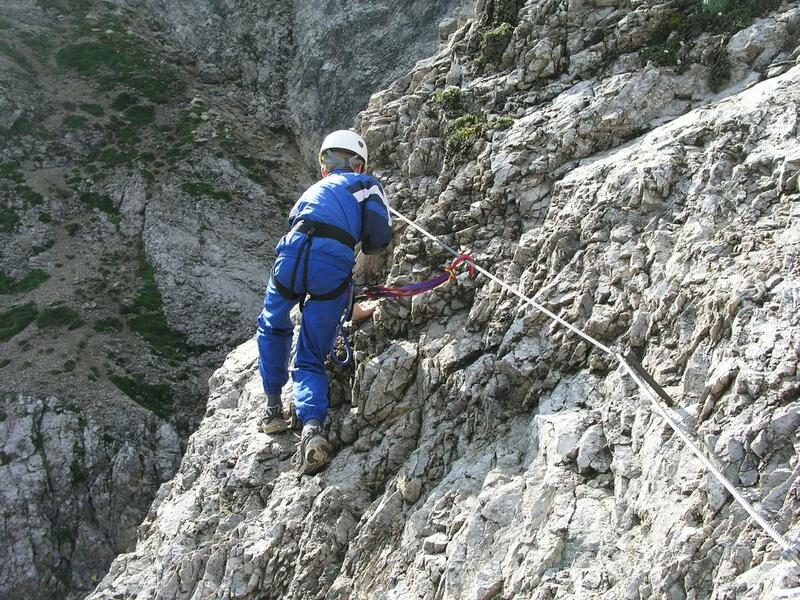 Arriving to the first part of this Via Ferrata route, it is time to check the equipment that must be carried and used: A proper harness, helmet, a Via Ferrata self-belaying kit consisting of two self-locking carabiners attached to your harness via a special rope friction device. 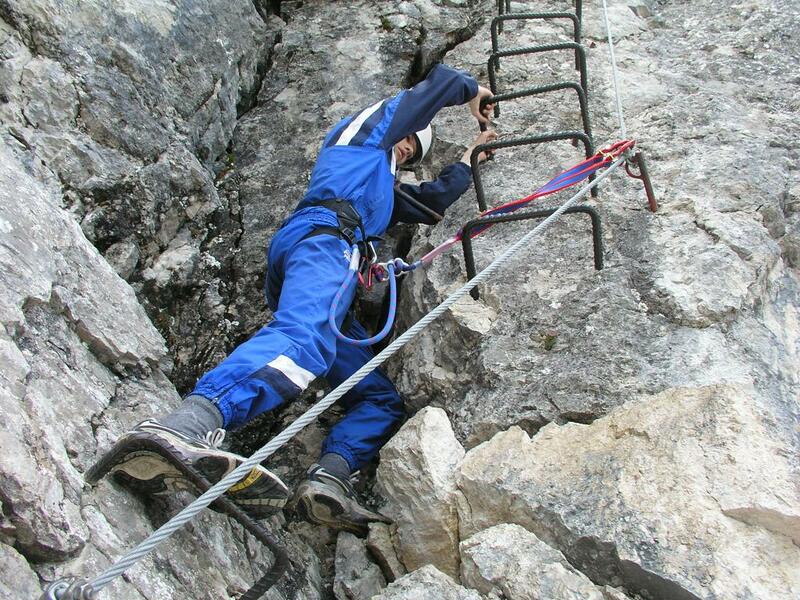 This latter device is used to reduce the impact of a possible fall along a vertical section of the wire, that would otherwise generate a very high load on both climber and the wire attachment point in the rock. This first section is short and easy, then follows an easy unprotected trail that brings you higher and a bit further left on the mountain. When you next attach your belay system, there will be continuous protection until you arrive at the final summit ridge a couple of hours later. The route now heads up some slabs of rock and around a corner that provide only small holds and is rather slippery being wet almost always. The exposure increases along this section as you see directly into the valley deep below. 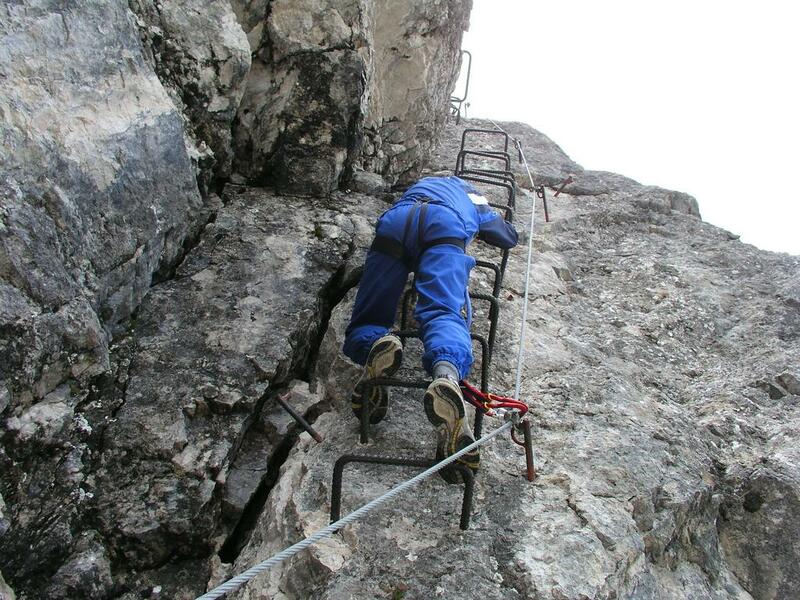 Further up, the route enters a vertical section (even a very slight overhang) where indiviual iron steps have been attached to the rock in a ladder like fashion. The sense of air and exposure is considerable along this stretch. 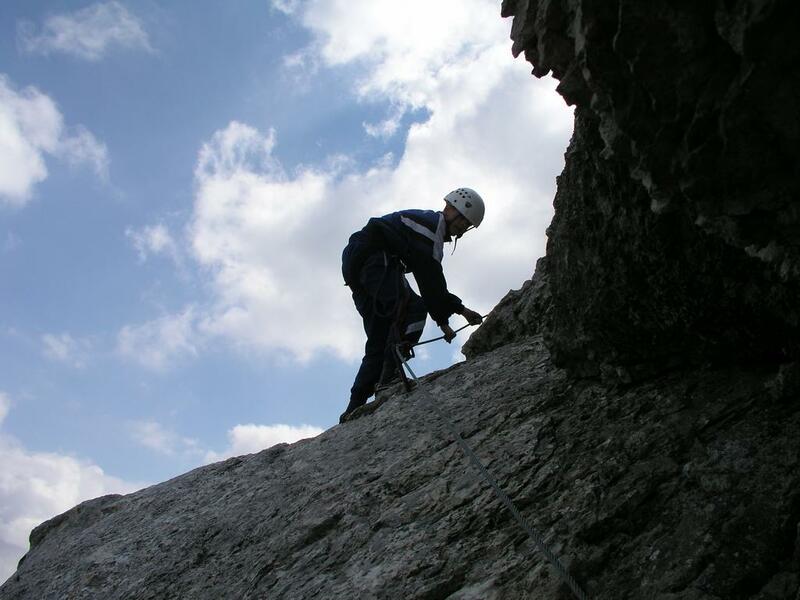 Higher up, the route climbs along cracks and narrow gullies where the technical difficulty using the rock for holds varies between (YDS) class 3 and class 4. However, every so often there are more exposed and steeper sections around corners and up across smoother rock with a fairly persistent sense of air and the valley deep below without much in between. See some of the pictures below for more detail. The route keeps going up for longer than one might think by looking at the horizon above, but eventually tops out in a small saddle on the north ridge. For the first time, you look down the opposite side of the mountain. Having been on a steep mountain face for such an extended period, it feels definitely good to see a ridge leading up to the right towards the summit. 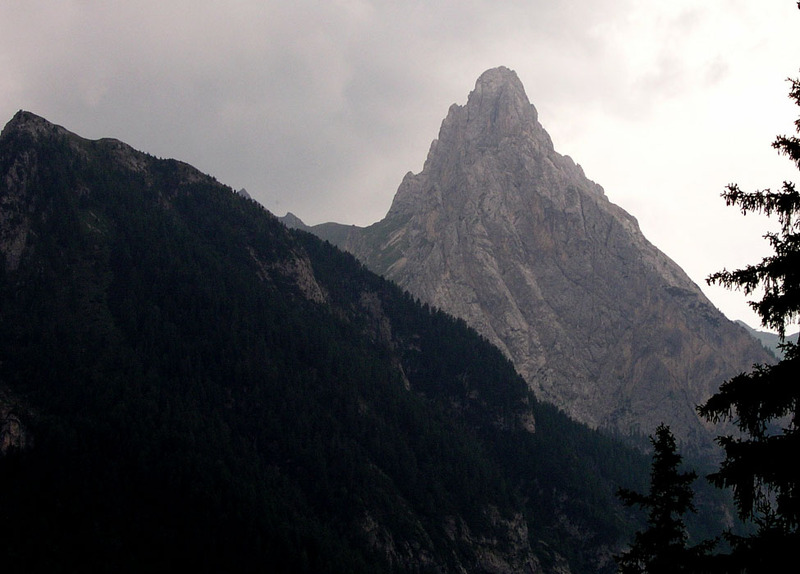 An added bonus is the impressive view of Marmolada. Its sheer vertical south face comes into view as soon as you enter the ridge. The very last section along this ridge to the summit is easy scrambling. Te summit is airy and offers good views in all directions, there is room enough for several parties along the short section of ridge. Having finished this route one should (weather permitting) take time to relax at this very fine place. Eventually, one proceeds with the descent via the "easiest route" (south side), as described below. 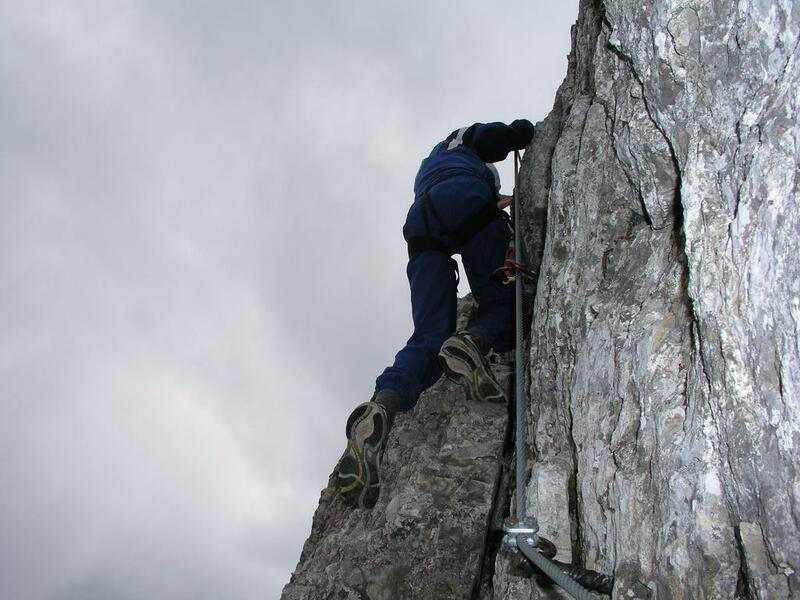 Difficulty: The difficulty of climbing clearly depends on how much one will use the wire belay system and other artificial (metal) objects for support. One must do this to a certain degree as there are passages that are very hard without. 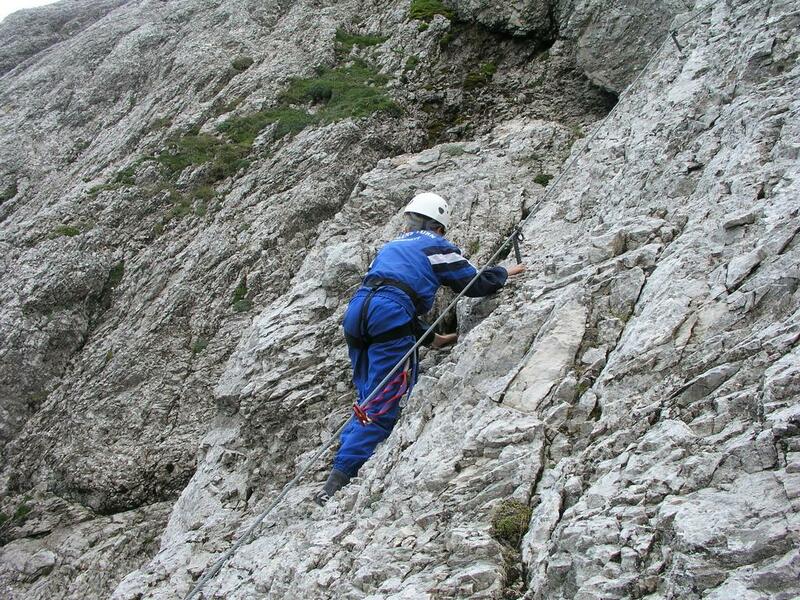 There exist separate rating systems for the Via Ferrata routes, the book "Via Ferratas of the Italian Dolomites: Vol 1", by John Smith and Graham Fletcher (Cicerone), rates this climb as a 3-C, where technical ability is on a scale from 1-5, while seriousness is rated at three levels A-B-C. 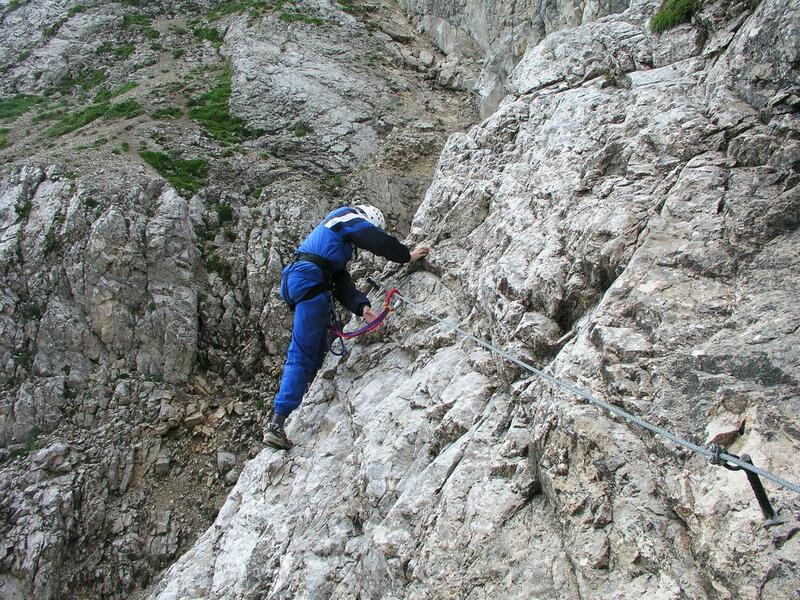 The book "Via Ferrata - Scrambles in the Dolomites" by Hofler/Werner (Cicerone) assigns this climb a letter grade of E on a 7 step scale running from A to G.
Ascent via the easiest route (south side). From the top of the Ciampac cable way station, hike into the valley heading south. You will see Colac towering above you on the east (left) side. 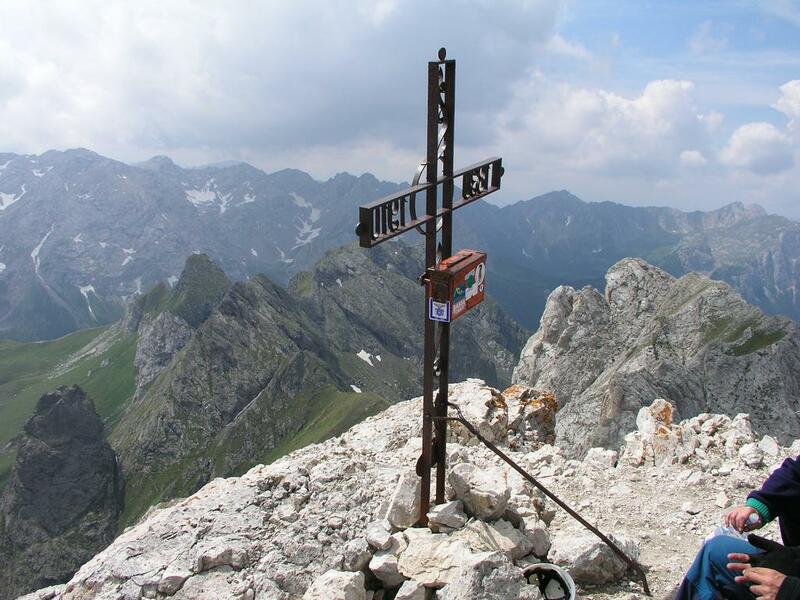 Follow the obvious trail (numbered 613 on hiking maps) that curves left and climbs into the broad saddle called Forcia Neigra. Make a sharp left in the saddle (towards the mountain) and follow a smaller, but clear trail as it contours further around the mountain to a south facing deep gully. The route ascends this gully gaining most of the elevation needed. After leaving the gully, easy scrambling will bring you briefly onto the west side of the mountain, then through a deep notch back to the other side for a final short section to the small and distinct summit ridge area. This route has some protection in place on exposed sections. 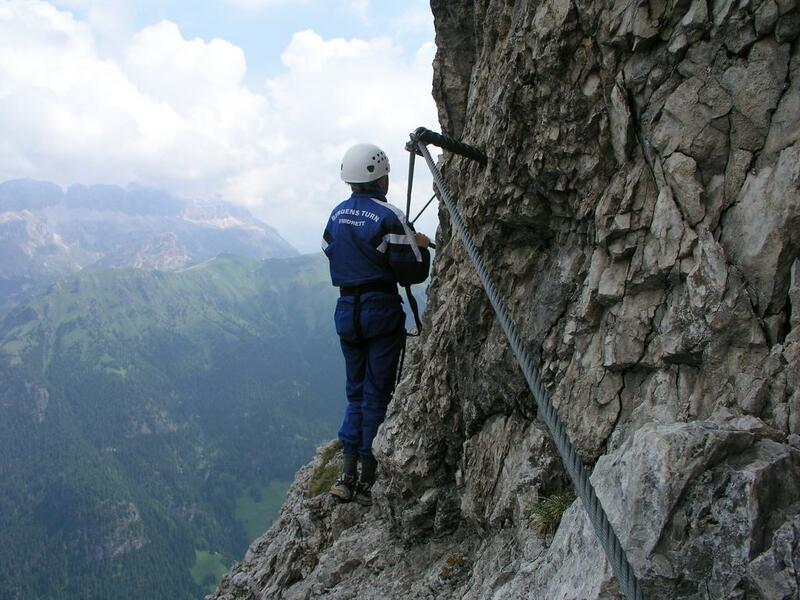 However, an experienced hiker can under normal conditions do this route safely without depending on or making use of the wire for actual climbing. It may be advisable to use it for safety belay in a few places (since it is there anyway). The technical difficulty of this route stays at (YDS) class 3 climbing. 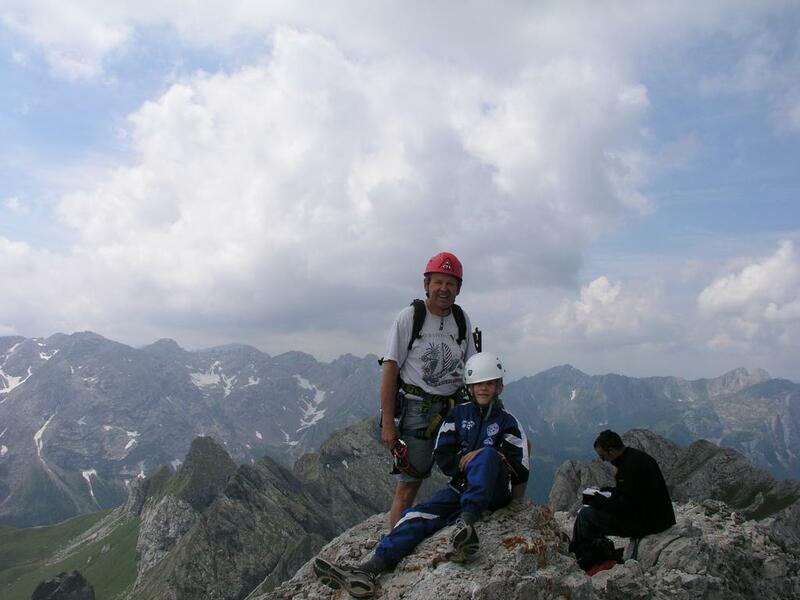 Comments: I did this "airy" introduction to Via Ferrata climbing with my son Pål Jørgen, age 15. We started climbing at 0930 and reached the summit after 2.5 hours of good climbing including many short stops for photography. The speed of this ascent clearly depends on how much one tries to climb on the rock traded off with climbing along the wire used for belay. We noticed other climbers that seemed to use the wire as the principal way of climbing also on the easier sections. 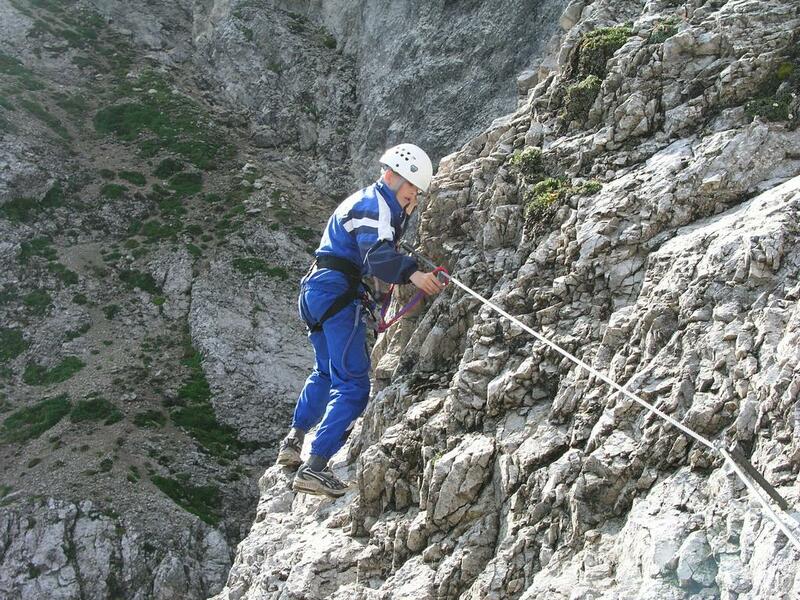 This may very well be the normal way of ferrata climbing, in fact, a strong point of the ferrata system is that each individual can proceed as he/she finds most enjoyable. We truely appreciated the views from the summit, a sense of accomplishment as well as a well deserved lunch, before starting down the "easy route" about 1220. The descent took less than 40 minutes and we planned to take the cable way down to Alba at 1300 only to find that this service (also!) had a lunch break (lasting) until 1330. We went on the next day and climbed Presanella. Colac as seen from the road. The beginning of the route, Pål Jørgen climbs in good style. Clipping, Pål Jørgen prepares to turn a corner. Around a corner, Pål Jørgen is enjoying the route. Steep terrain, with tremendous exposure. This is a bit tricky. Steep terrain, best to focus on the task ahead. A look back, we came up from there. Another corner, there is little but the wire to hold here. Easier terrain, Pål Jørgen keeps climbing. Fantastic view, from a nice position. The village, is straight down. Father and son at the summit. The summit cross on Colac. The Colac NW face with the Ferrata Finanzieri.